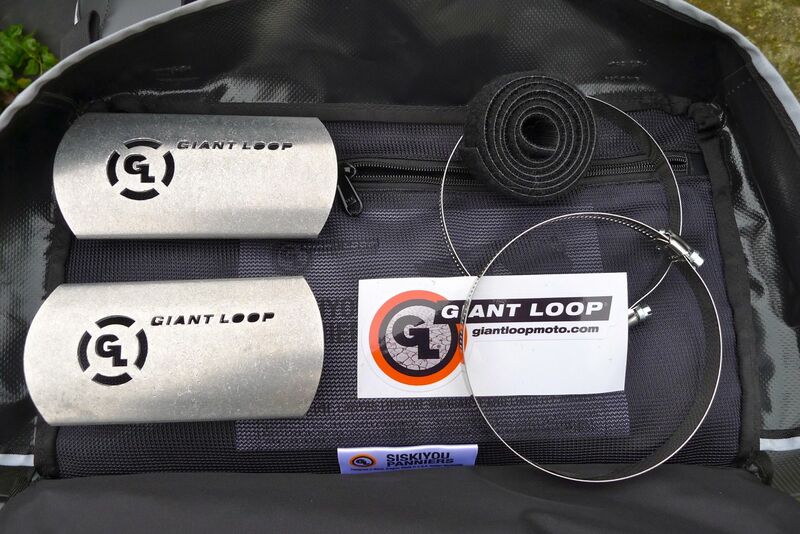 Giant Loop are well known for their innovative ‘horseshoe’ bags which wrap around the back of a dirt bike but which, in my opinion, are not especially easy to use day-in, day-out and have been proven not to be waterproof and have zips which can be weak points. That may not matter for a weekend run with your mates in the hills, but does on the overland. 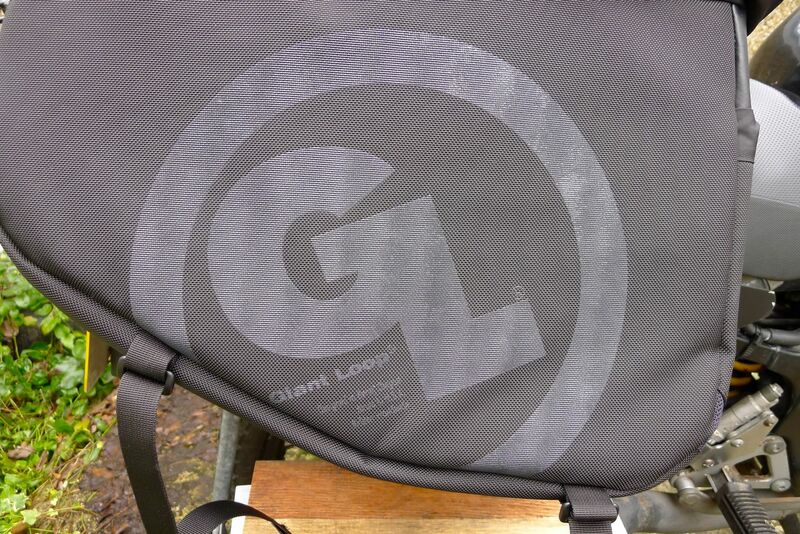 Now Giant Loop have joined the likes of Enduristan, Adventure Spec and a few others in producing a conventional throwover pannier, the Siskiyou, named after a mountain range in southern Oregon. These types of panniers are just about as old as motorcycling of course, up till a few years ago Ortliebs were widely used by moto travellers. I recall my first pair of ‘soft bags’ in the late 70s, elegant lightweight cases (left) crafted from a lustrous space-age combination of vinyl-coated cardboard. 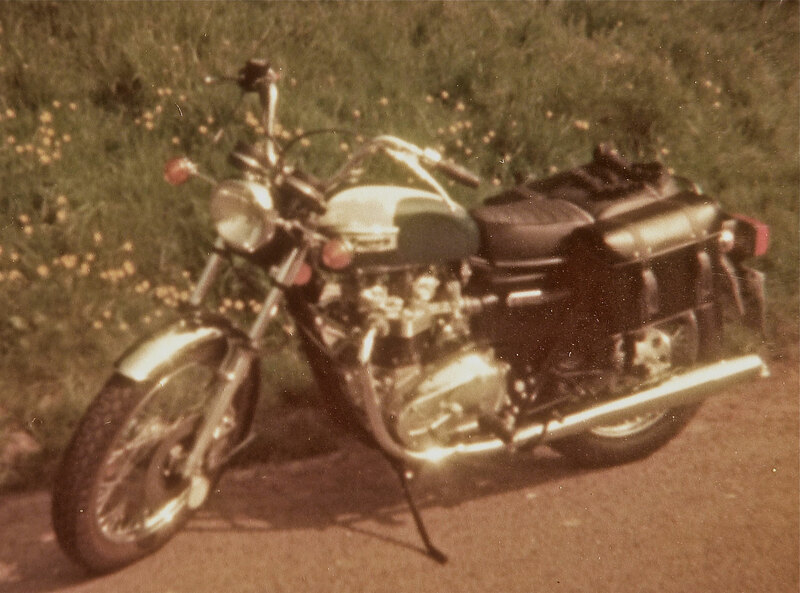 But this was the advent of the monoshock era where soon they’d be no more twin shocks to keep the swinging pannier backs out of the rear wheel or final drive. As I say elsewhere, over the years I’ve melted my fair share of soft panniers and even dealt with small luggage fires (right). Nevertheless, I still prefer soft luggage for overland or adventure travel despite the drawbacks of security, perhaps combined with one small detachable hard case for valuables. 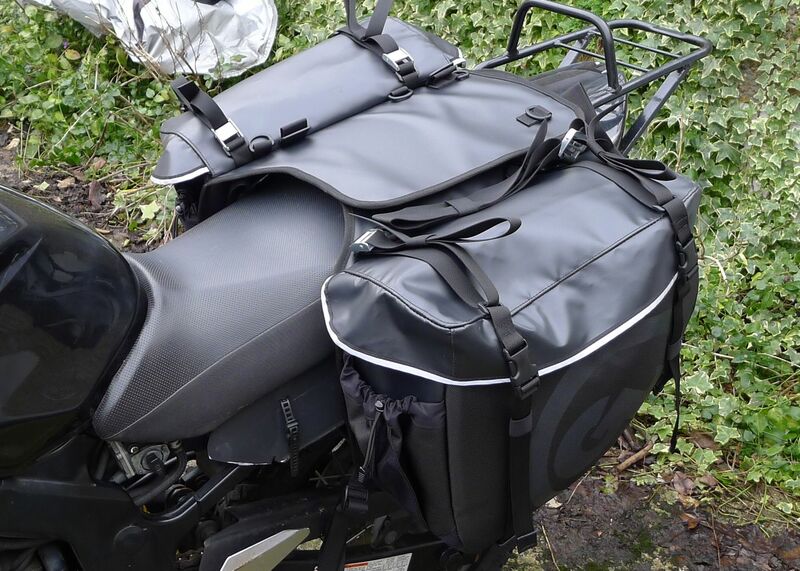 These panniers were sent to me for a day’s assessment by UK importers Adv Spec. 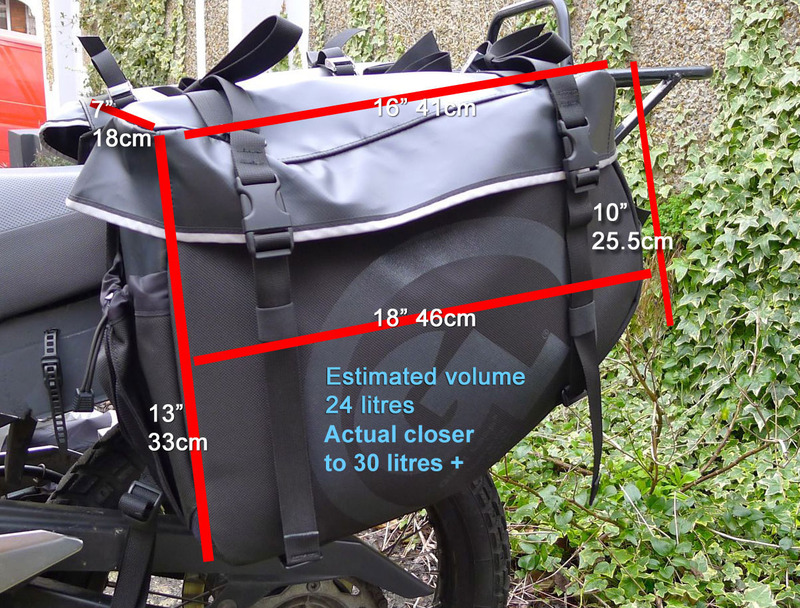 The GL website specs shown above left also claim each pannier has a volume of ’35 litres’. I’m not the first person to question how they arrived at this figure; my calcs put it at more like 24 litres. We’re all used to exaggerated claims, but that was quite a discrepancy. I read that they measure their luggage products by filling them with beans and doing so I suppose it’s possible that a soft fabric pannier would bulge out. In fact I’ve since found that that is exactly the case so Giant Loop’s estimate of 35 litres is right in the ball park. GL are fairly ambiguous about what they’re made from other than ‘military-spec materials and construction‘, but it looks like the well-proven and widely used combination of a Cordura shell with a vinyl back, interior and lid. Unusually, sandwiched inside this thick shell is an unseen additional layer of closed cell foam, or something similar. 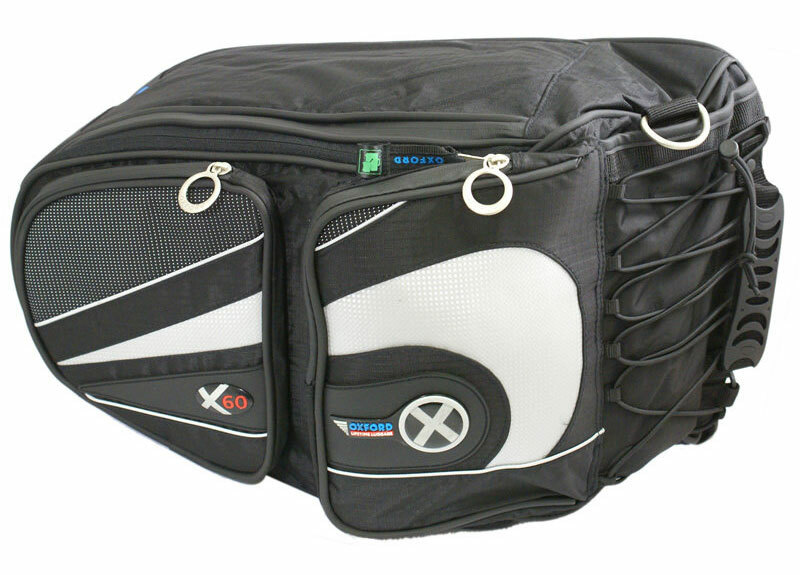 It helps shape the bags and also reduce damage by padding the contents when you crash. GL wisely suggest that any hard-edged items in the baggage are well wrapped for such an eventuality: it’s standard practice in packing soft baggage. Rather like the Monsoons, the top edge of the Siksiyou’s shell has a sewn-on sleeve of coated nylon with a thin zip and roll-up clips, similar to a dry bag. 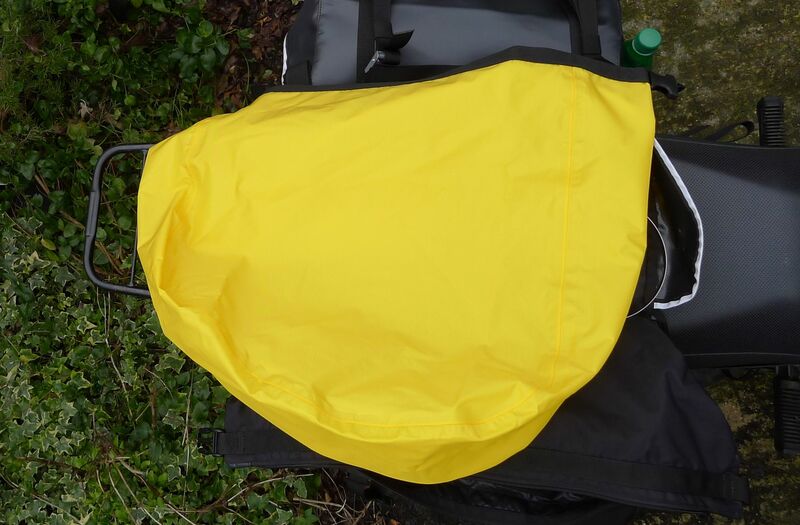 Inside you get a separate yellow nylon liner (below right) cut more or less to fit in the panniers, with well-taped seams, a thick layer of TPU coating on one side, plus another thin zip and roll-top clips. Over the top of this drops the thick PVC lid which clips down on straps, with additional separate straps for attaching stuff to the top of the lid rather than tucking it under the lid straps – another nice touch. Inside the lid is a flat zipped mesh map pocket. 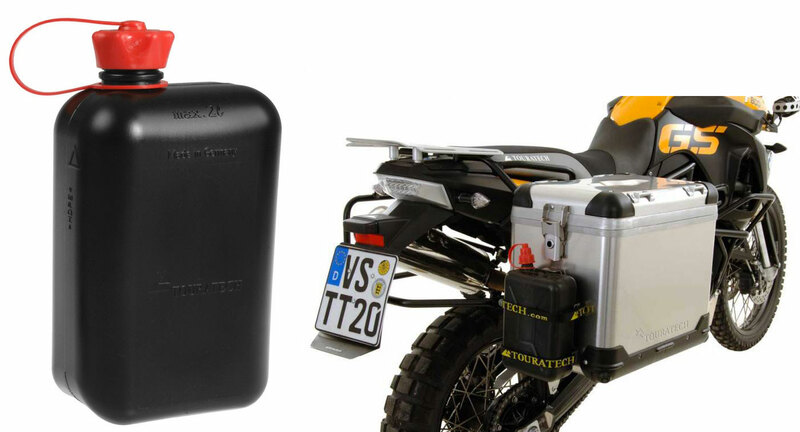 There’s also a small cinch-cord pocket on the front of each pannier, but although they describe it as ‘bellowed’ it’s actually a simple wedge that’s nowhere near as big nor usefully box-shaped as the four pockets you get on Magadans although it’s said they’ve been designed to take 2-litre Touratech cans, as pictured left. 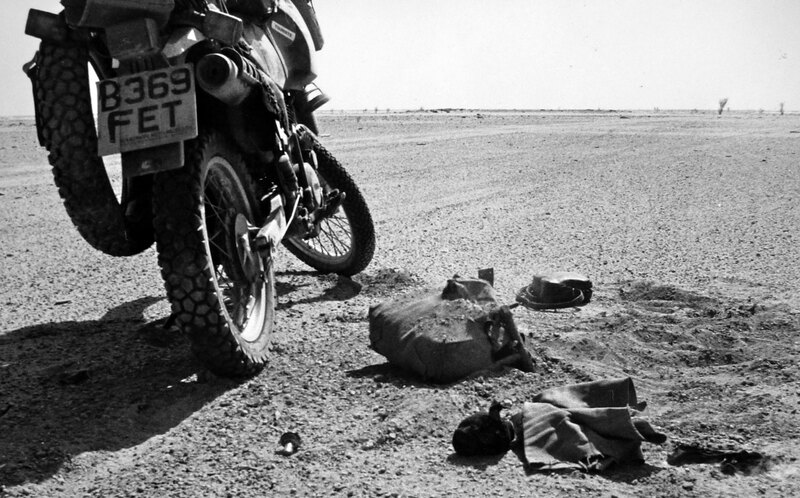 On the right, a 1.5 litre water bottle in the pannier’s pocket. 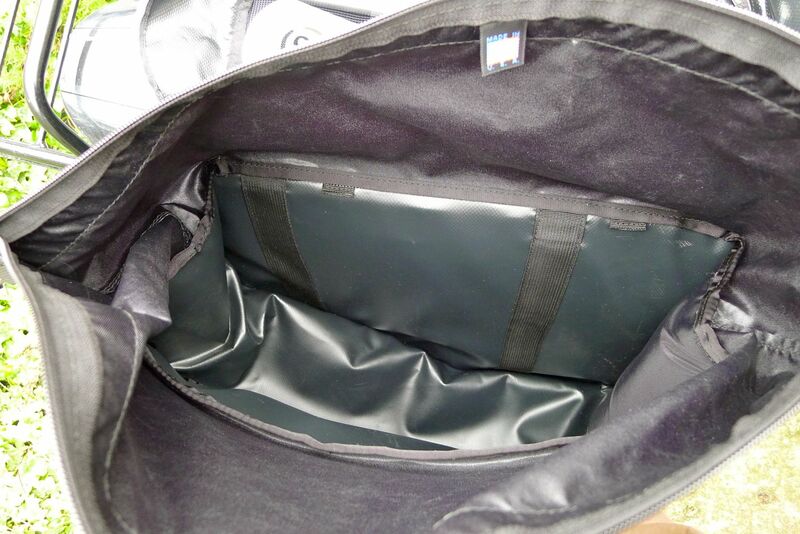 The two bags join together using broad vinyl velcro pads. 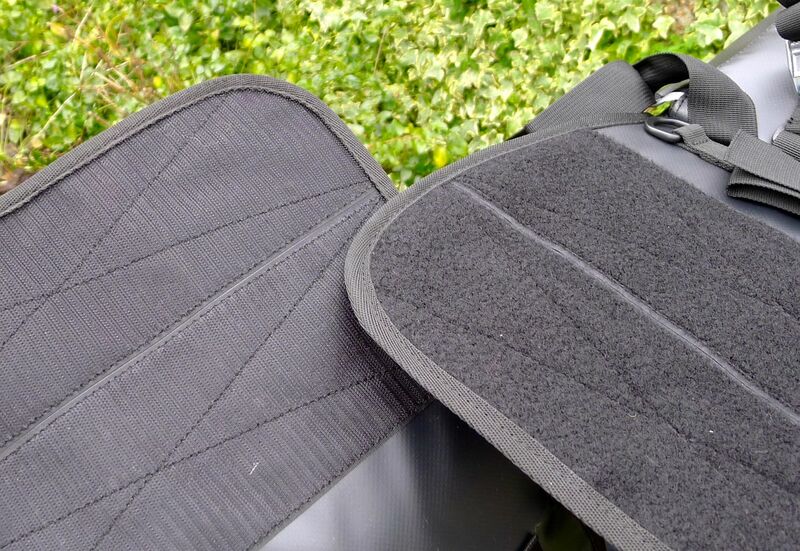 These pads feature additional lashing rings to secure other luggage or to fix it all to your bike. The Magadans use the same system, but with a pair of wide velcro straps rather than full-width pads which seems bit OTT. 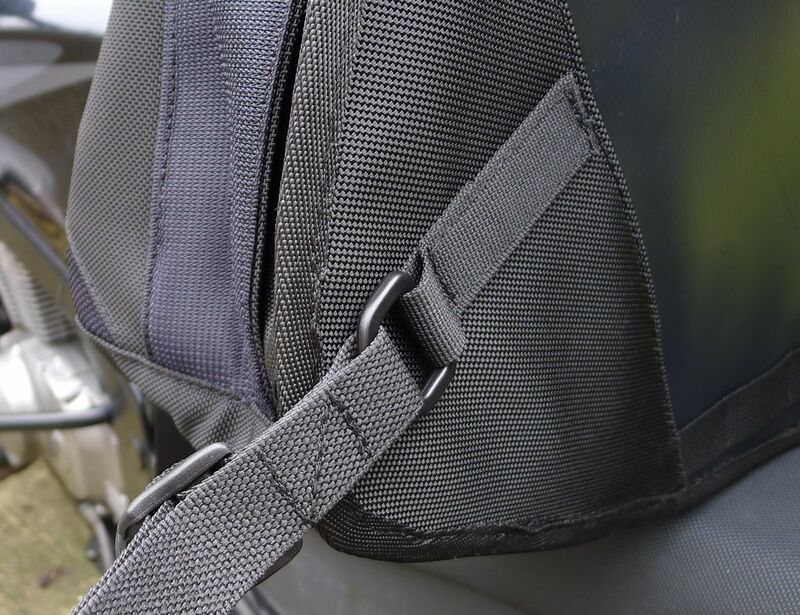 Me, I’d prefer buckles and straps over velcro anyway, because as the volume of your load changes or rough roads take their toll, fine tuning the tension may be required – and that’s much more easily done with adjustable buckles that super sticky velcro, be it strap or pad. On the Mags such a buckle mod is easy to do – with the Siskies you’re stuck with the pad which I’m also not sure would be great to sit on on a hot day. 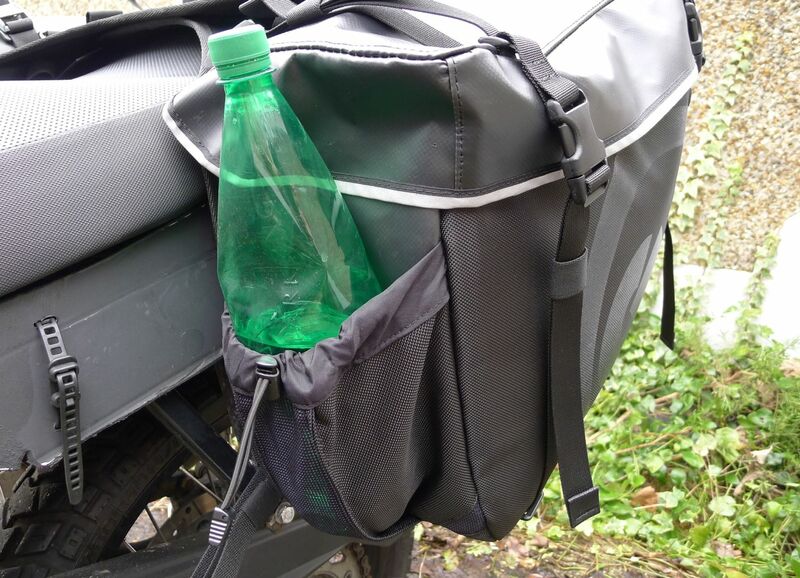 The GL installation page suggests: “For 2-up riding, affix a small seat cushion to the top of the Siskiyou Panniers“. 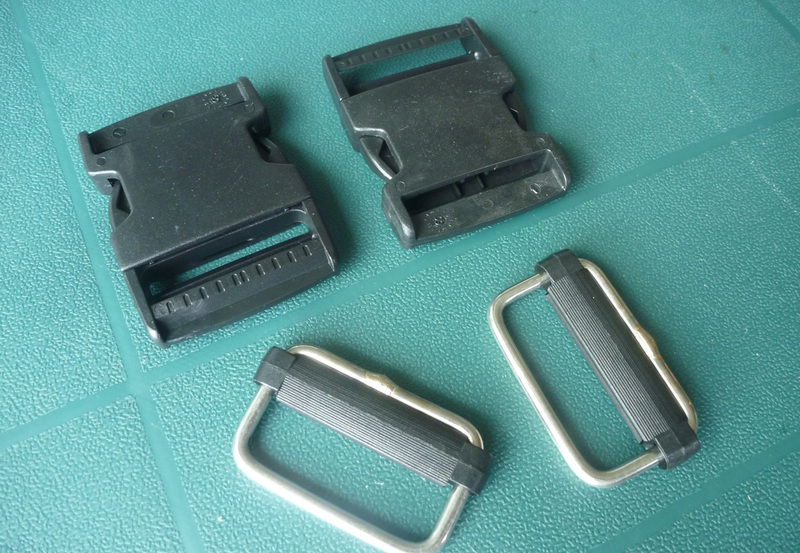 To stop the bags sliding back you get a strap to attach to the pillion footrest or thereabouts (left), as on the Monsoons but something that was missing from the Magadans’ first version. Subsequent versions low have a tie-off D-ring. Included with the Siskiyou bags are a pair of alloy exhaust guards (rather like I bodged on my Suzuki – I got the idea from GL). You also get two hose clips, some instructions and a sticker and to stop your sidepanels getting scuffed GL can also supply some protective vinyl film. 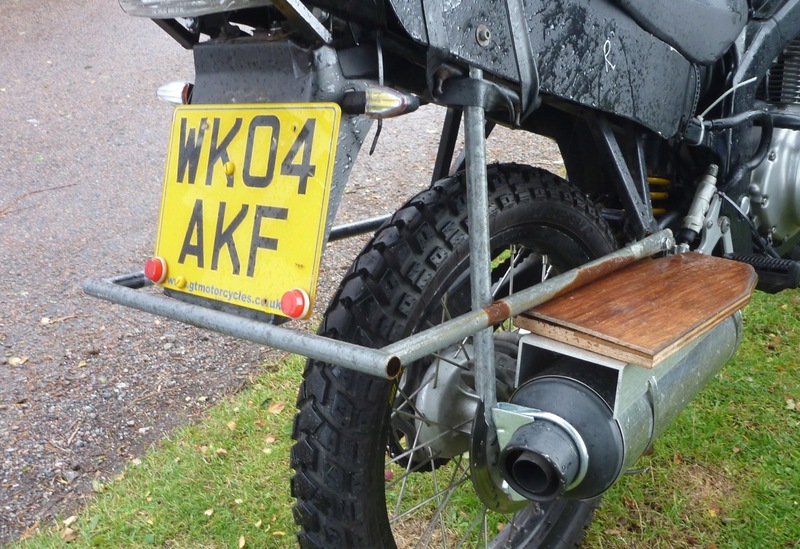 The exhaust guards are an admission that many a soft pannier has melted like a Cornetto when it shifted or otherwise got too close to the pipe. Modern efi bikes with catalysers run especially hot and indeed the Siskiyou panniers tested on a Husky Terra by Cycle World magazine (April 2013) melted. So like GL say, additional guards may be needed. On any bike you need to think carefully how loaded throwovers will react when they shift on rough roads against a hot pipe. This need avoid or deal with meltdowns with soft bags is why some riders understandably prefer hard alloy or firm resin boxes, although in my opinion mounting soft bags on some sort of rack is the way round this flaw. The Siskiyous have a sporty cutback base which makes them more suitable for regular bikes with low, upswept pipes. The Oxford X60s (above left) are similarly profiled but sell for as little as £130 (they’ll need a waterproof liner for sure). Whatever, this shape will greatly increase the Siskiyou’s fitting options to many more bikes than the usual adv suspects. The GL logo is emblazoned on the sides, but in a pleasingly understated way. Unless that ‘GL’ logo glows, I’m not sure there any reflective surfaces as found on the Mags and Monsoons – possibly the thin edge of the lid? I did also wonder if access would be a bit of a faff. If they’re fully locked down you unclip the two lid straps, unclip and unroll the outer bag and unzip it, then unclip and unroll the inner bag and unzip that – and you’re in! Of course you don’t need to use those zips; their protection against waterproofing is minimal and zips can jam or break when dirty or used carelessly. In this respect I prefer the bomb-proof, roll-top simplicity of the Magadans and the Monsoons. 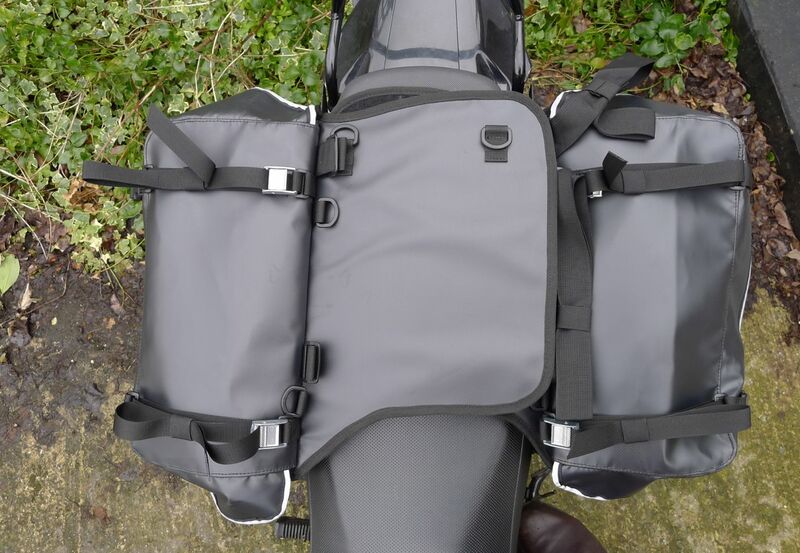 So all up you’re getting a good sized touring pannier that looks well made and is usefully featured. The foam protection sandwich is a nice touch, as is including exhaust guards and several lashing points on under and behind the bags; you get a feeling they took a lead from Enduristan here. But – is this £475 ($700) worth of pannier when in the UK Magadans go for £350 and Monsoons for just £230? I wondered that perhaps if you’re paying for the ‘limited lifetime warranty‘ but that only covers the “original purchaser… against … defective materials and craftsmanship only, and does not include damage due to normal wear and tear or misuse“, so no big deal there; after a year they could just put any failure down to wear or misuse. The Siskiyou panniers certainly feel like they’re up to the rigours of overland travel and design and features fit the bill without any radical innovation. You just need to ask yourself in turn whether the bill for a set lives up to your expectations. 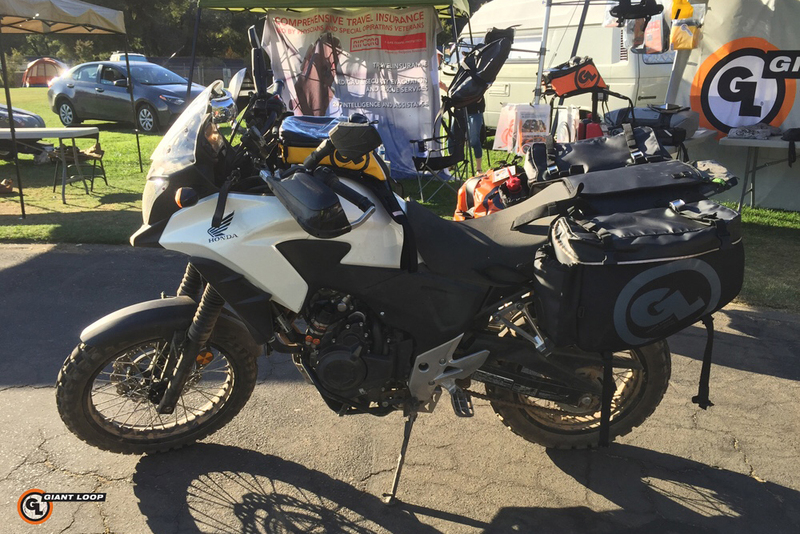 This entry was posted in Adventure Motorcycling Gear Reviews, AMH News, Luggage and tagged adventure spec magadan bag, Enduristan Monsoon panniers, Giant Loop Siskiyou pannier review, Giant Loop Siskiyou Panniers, oxford lifetime x60, small luggage fires. Bookmark the permalink.